When do you shift from providing some caregiving to becoming the caregiver? When does a few hours of caregiving service become a full-time job? When does your status change from daughter to care provider? And where does the love go? Family caregivers often take on their roles with good intentions. They love those that are in need of care, and they are willing to step in and provide that service. They don’t often realize what they are getting themselves into. Caregiving is not a weekly volunteer position that you can serve in for a few hours then leave and return to your life as if nothing has changed. As many caregivers come to discover, caregiving can and often does become your life. When caregiving begins to feel like a full-time work position, it’s difficult not to be caught up in the mindset that this is something you have to do not something you want to do. The more you view caregiving as a job, the worse the situation will feel for you as a caregiver. Caregivers spend an average of 20 to 40 hours per week providing care for a loved one. The services they provide within that time essentially for ‘free’ are collectively valued at $375 billion per year. [ii] In addition to giving of their time and energy, family caregivers end up paying out-of-pocket for many caregiving costs totaling about $5,531 per caregiver per year. [iii] As you can see, caregiving as a job takes much more time and money than it will ever give. Family caregivers who believe that caregiving is their job and not much more suffer emotionally. Forty to seventy percent of family caregivers have significant symptoms of depression with about a quarter to half of these caregivers diagnosed with major depression. [iv] When you take the love and purpose out of caregiving, you just feel like you’re giving, and giving, and giving in a cycle that always ends with you getting the short end of the stick. As a family caregiver sometimes you just need to stop giving and start caring. Remember why you became the caregiver in the first place. Maybe no one else was willing to take the job. Maybe you felt obligated. Maybe you weren’t ready to just jump in but were feeling overwhelmed and a little nervous. Whatever the original situation and the reasons, at the heart of it all you took the job because you cared for your loved one. 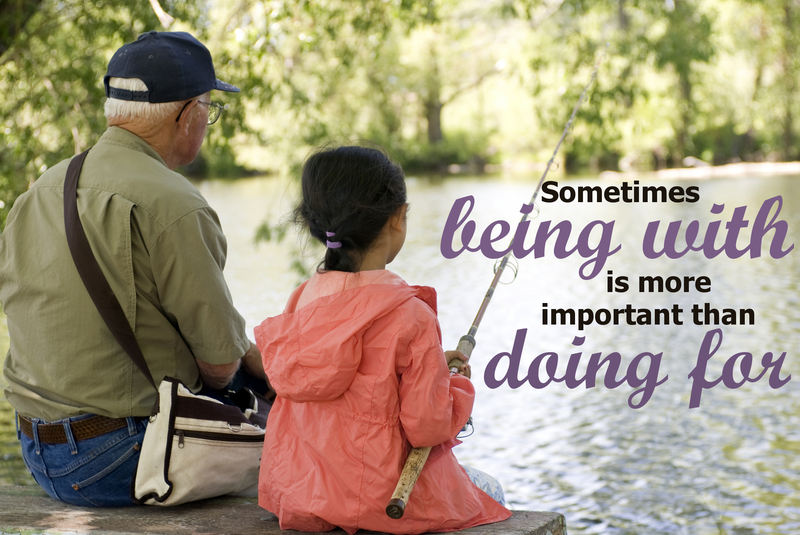 The National Caregivers Library says, “Sometimes being with is more important than doing for.” You’ve been a caregiver for hours upon days upon weeks. Stop. Be a daughter or son again. Just for a few hours, letup being the family caregiver and start being family. Sit down with your loved one. Talk to them. Slow down and enjoy a few moments simply being with rather than constantly doing for. Caregiving can be one of the most rewarding experiences of your life. Don’t lose sight of the driving engine behind the giving. Remember to love, remember to care. You’re not just an employee. You’re a neighbor, you’re a daughter, and you’re a friend. Give care and give love, and you’ll find you will get much more satisfaction in return.